“In all due respect,why don’t you just hire the FedEx? Do you like the sarcastic and ironic twist of “Pulp Fiction” and “Reservoir dogs” ? Looking forward to some bloody scenes filled with senseless violence? Or are you addicted to the absurd touch of a David Lynch creation full of confusing plot lines and bizarre characters like in “Twin Peaks” ? Then “The Bag Man” could be a movie you fancy. Not that this creation can match the work of Tarantino or Lynch. But despite the thin story with a simplistic content, it was somewhat entertaining for me in various ways. In terms of content, director David Grovic kept it real simple. We see Jack (John Cusack) in a meeting with Dragna (Robert De Niro) while travelling with his private jet. They discuss a new assignment for Jack. A dead simple task for Jack who, as we find out later, already did odd jobs for Dragna for many years. He needs to pick up a bag somewhere and bring it back to Dragna without glancing at the content. Jack assumes that’ll be a piece of cake, until he notices that he’s being attacked by strangers who all know something about the bag and who try their utter best to get it in their possession. Crazy, obscure and weird persons. What comes next is the appearance of a series of crazy, obscure characters and weird persons. A receptionist who sounds as if he’s under influence all the time. He looks completely innocent and a bit fogey, until you touch his wheelchair. Then there’s a duo looking like secret agents. A tall prostitute with a pair of legs that every woman would be jealous of and dressed in an absurd-looking Superwoman outfit. She’s accompanied by a dwarf and a pimp with an eye patch. Then we are introduced to some police officers who are way too curious and use some rather perverse methods of interrogation. And it doesn’t take long before bodies start piling up. Eventually the film degenerates into a complicated cat and mouse game, full of strange incomprehensible twists in the storyline and a reasonably disappointing denouement. I thought of “Seven” immediately. What are De Niro and Cusack doing here? For me it’s a complete mystery how they could persuade the two well-known actors De Niro and Cusack to play in such a surreal and lugubrious film. Admittedly, the two men haven’t played in a memorable film for a long time. The last movies I’ve seen with De Niro (“The Big Wedding“, “Killing Season“, “The Family“,”Freelancers“,”American hustle” and “Last Vegas“) aren’t comparable with great movies he played in before. Although he has some experience in playing a gangster, don’t expect him to look like Al Capone as in “The Untouchables“. The only memorable thing and real eye-catcher there is to remember when it comes to Dragna, is the absurd and wrong hairstyle he got. Also Cusack’s contributions to recent films were minimal and insignificant (“2012“, “The Numbers Station“, “Grand Piano” and “The Prince“). The only striking thing is his disinterested and sleepy look he demonstrates in each of these movies (or might it be an attempt to look impassive ?). In retrospect, this might just be the link between both actors and the reason why they were summoned. Next to the two main actors whose performances were still acceptable (especially Cusack who remained stoically calm despite the ongoing chaos) although it was substandard, there was also Crispin Glover (yes George McFly from “Back to the Future“), who played a memorable part as the slightly deranged desk clerk Ned. Conversely there was the failure of Rebecca Da Costa as the sensual Rivka. The amount of shown naked skin, curves and fleshy lips impressed more than her acting skills. Expect some tight stretch clothing, filled with quivering flesh which looks like popping out any moment. And there’s also a scene at the sheriff’s that appeals to one’s imagination. I like to watch such a surreal, dark film full of sarcastic humor and violence. But to be honest, I think that there’s only one person who can mix these ingredients into an explosive, entertaining cocktail. Tarantino of course. 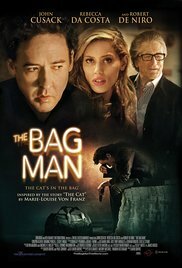 “The Bag Man” isn’t a bad thriller but sadly enough the tension and suspense are absent.